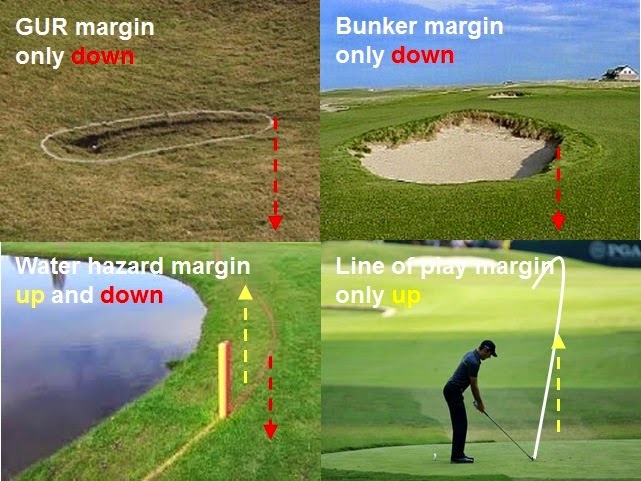 I don’t like these weekly blogs to be too complicated, as my objective is to make the Rules easier to understand for the majority of golfers and not to confuse them. However, I have been asked a question about the vertical limits of margins, which can trouble the best of us. I hope that I can some shed light on their significance by describing some scenarios that you may encounter on the course. The margin of ground under repair (GUR) extends vertically downwards, but not upwards. The margin of a (lateral) water hazard extends vertically upwards and downwards. The line of play extends vertically upwards from the ground, but does not extend beyond the hole. A ball lies against the root of a tree that is growing inside GUR, but the root is outside the white line margin. Ruling: There is no relief available, without penalty, because the margin only extends downwards. Although a player is standing well outside an area of GUR there is still interference to their swing from on overhanging branch of a tree that is rooted in GUR. Ruling: As the tree is growing in GUR it is part of GUR and because the margin does not extend upwards the player may take relief without penalty. A ball enters a burrowing animal hole in a bunker and rolls underneath and past the margin of the bunker. Ruling: The ball is not in the bunker because the margin only extends downwards. The player may take relief, without penalty, from the abnormal ground condition outside the bunker. A ball lies on the edge of the bunker overhanging, but not touching the sand. Ruling: The ball is not in the bunker, because the margin does not extend vertically upwards. A ball lies in the branches of a tree inside the margin of a (lateral) water hazard. Ruling: The ball is in the water hazard, even if the tree is rooted outside it, because the margin extends upwards. A ball enters a burrowing animal hole and comes to rest underground, but within the margin of a (lateral) water hazard. Ruling: The ball is in the hazard, because the margin extends downwards. A player’s ball lies a few yards away from a tree which has mosses hanging from its branches that are directly in the line of play. Ruling: The player may not move the mosses, which are considered to be part of the tree (Decision 13-2/37), as this would improve their line of play, which extends vertically upwards. You may already be receiving my weekly blogs by email (if not, please enter your email address in the top right hand corner of the web page). But are you receiving my weekly 'Rhodes Rules School' issues? They are completely free, are delivered by email and you may unsubscribe at any time. Click on this link to subscribe. Several thousand golfers of all abilities have found these explanatory Rules scenarios (with photos) interesting and/or useful. I recall Phil Mickelson in the Masters a few years ago when his putt was deflected by falling detritus from a tree. I don't believe he replayed the stroke. Could he have? I think that you meant to post this comment after last week's blog of mine. If you go to YouTube and search for "Phil Mickelson Very Unlucky Putt at the 2010 Masters_HQ" you will see that the twig that diverted Phil's putt was stainonary when his ball hit it, so he was not permitted to cancel the putt and take it again, which is only relevant when an object in motion diverts a ball in motion. Not being able to play golf this afternoon I tried to understand better the GUR ruling re roots in your questions. If a tree rooted within GUR is part of GUR as in the definition and confirmed by Decisions 25/10, 25/10.5 and 25-1a/1, why is no relief given for 25/10.7? Surely the root is just as much a part of the tree as its branches. The brief description in 25/10.7 does not say anything about the relationship between root and ground and this might have affected the decision eg If the root is covered in soil there is a conflict between two parts of the definition – the margin and the status of the tree. If the root is exposed but resting on the soil what then? What if the root is raised clear of the ground? My local rules guru is avoiding the issue! In Decision 25/10.7 the root is part of a tree growing within ground under repair (GUR)that extends outside of that area at ground level. In the unlikely circumstance that a root of a tree, growing in GUR that is raised clear of the ground outside of the GUR, interferes with a player's stroke, in my opinion, the player would be entitled to relief in the same way that they would from the branch of a tree in a similar circumstance.